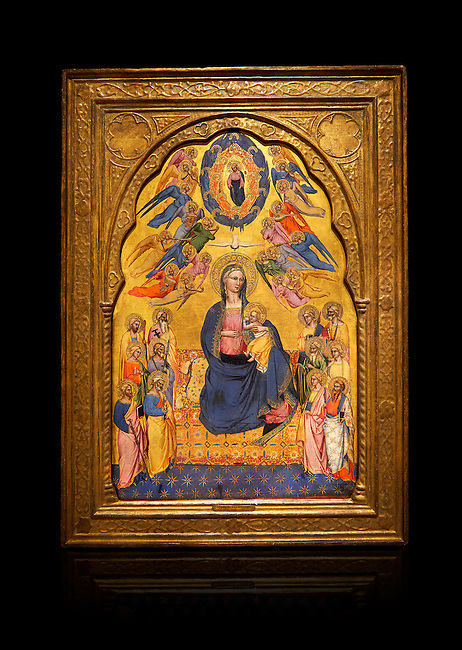 Gothic altarpiece of Madonna Of Humility With The Eternal Father In Glory, by Cenni di Francesco di Ser Cenni of Florence, circa 1375-80, tempera and gold leaf on wood. The Madonna and Child are depicted with the 12 apostles. National Museum of Catalan Art, Barcelona, Spain, inv no: MNAC 212805. Against a black background.